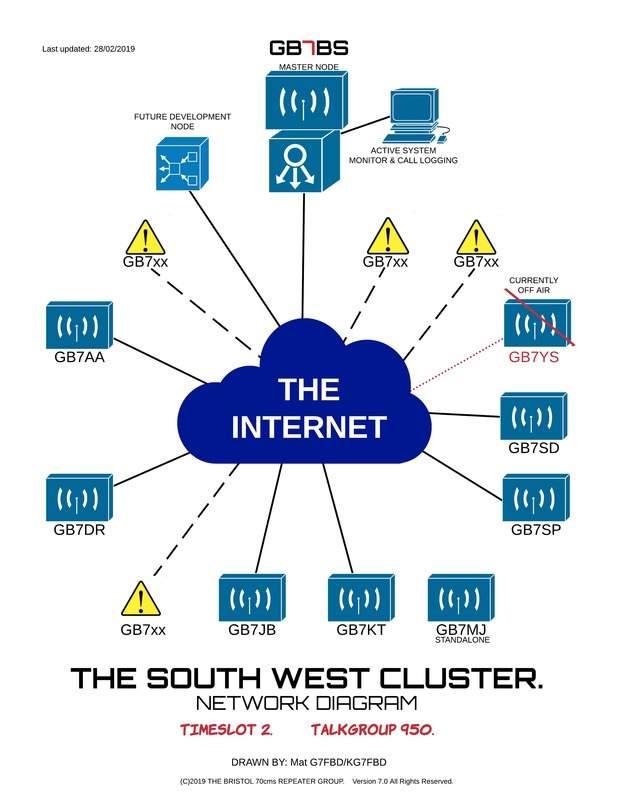 The South West Cluster Network. Most of the repeaters were located on remote radio sites, so getting a broad band connection to each of these sites was the next challenge and cost. A few of the repeater groups either already had broad band on site or managed to share a connection with an existing site user. For the rest, we had to find a back haul link to the nearest broad band service. In GB7BS’s case we already had 2.4GHz WiFi Linking equipment and proceeded to get the RF Link installed at each end. Unfortunately this link proved to be problematic once it was switched on and we quickly realised that it could not be used reliably. After a short delay, new back haul link equipment was purchased; this was cheaper than getting Broad Band installed on site from a telecoms provider, which we could not afford anyway. The 2.4GHz link suffered from interference at Mat – G7FBD’s QTH where it would link into his home broad band network. This interference turned out to be from the many home WiFi units in the built up area, raising the noise floor and blocking the link receiver. The new back haul equipment purchased was an Ubiquiti Nanobeam M5 5GHz link, with much better spec, faster speeds and using up to date technology. The new 5GHz link equipment was installed (see YouTube Video) and was soon operating, this time error free and well within link budget calculations. We now had more bandwidth on site than we would probably ever need, especially as a typical DMR Network connection only needs around 50 kbits/sec. Now we could start linking the repeaters. The first to link up with GB7BS was GB7AA. Then over a period of a few months followed GB7SD, GB7JB and GB7DR. The South West Cluster was complete! There is currently a world wide DMR network. This concept was developed initially in the United States and has spread all over the world including the UK. This network is based on Motorola’s IP Site Connect system. This world wide network is called DMR-Marc. There is plenty of information on the web regarding DMR-Marc so this page will concentrate on the South West Cluster Network which is currently NOT connected to the DMR-Marc Network. The reasons for this we hope will become clear and the purpose of these pages will explain why, what we do differently along with details of our Network and how it operates. Back in 2013 the Bristol 70cms Repeater Group were looking at the growth in DMR and decided to look at the feasibility in running such a repeater at our Lansdown site which already had the well established Analogue repeater GB3BS. An initial look at the frequency assignments being made for Digital repeaters made for some interesting RF calculations as the Digital Tx to Rx splits were now at 9MHz and with the repeater transmit channel being at the high end of the 70cms band placed this very close to the existing GB3BS receiver input frequency and vice versa with the Digital receive channel. In fact there was, at best, only some 700 KHz of separation! This arrangement seemed crazy and how the band planners came to this decision is, at best, interesting! Never the less we took to the challenge. But to make things even more interesting we decided that our Digital DMR Repeater would also share the same antenna as our Analogue counterpart, GB3BS. In late 2013 we submitted an application for a NoV to run GB7BS. We had expected that such a NoV would take some 6 months to come through, giving us time to gather hardware together, decide on a design and find a way of raising funds to purchase the Motorola DR3000 repeater. In January/February of 2014 we were taken aback when the NoV to run our new Digital repeater came through in such a short period of time, as it did for a number of other repeaters around the UK. During the early part of 2014 we had, by chance, discussions with other repeater groups within the South West and soon found that we had similar ideas and that linking of several repeaters would be a good project to undertake while keeping it divorced from the world wide DMR-Marc Network. The name South West Cluster was born! As time marched on the various Repeater Groups involved proceeded to prepare and set up their own Digital DMR Repeaters. First to come on air was GB7AA and operated as a stand alone repeater. Then, after a few delays, in October GB7BS came on air. During the following months the other repeaters GB7SD, GB7JB and GB7DR also came on air. At this stage, all repeaters we operational in their own right and had no interlinking, that was the next target!